Do you ever have those mornings were you just can’t get full? You eat breakfast and then you just stay hungry? Well, I’m having one of those mornings right now. And staring at pictures of food I wish I was eating is definitely not helping. I may be eating lunch at 10 am today, at this rate! These taquitos are an acceptable breakfast, right? They’re in a tortilla, which is like a breakfast taco minus the breakfast-y ingredients. But it counts, right? No? Well, if I had some in front of me right now, I would most definitely scarf them down. Sadly, I do not have any so these pictures will just taunt me until I finish writing this post. 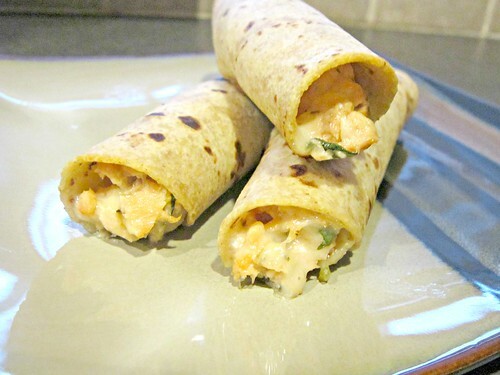 I wasn’t sure how a salmon taquito would turn out, and J definitely thought it sounded weird, but there aren’t many (if any) things I’ve found that don’t work well rolled up in a tortilla with cheese and dipped in guacamole. AmIright? The original recipe called for these to be fried, but as you know…this girl don’t fry. Not that I don’t love a good crispy-fried treat now and then (corn dog, anyone?) but I just don’t generally do it at home. I figure if I cook mostly healthy at home, I can afford to be a little bad on the occasions that we eat on the run while we’re out and about. I turned down ice cream the other day. GASP! I know, I know…sacrilege. J’s theory is that the only time your body should have sugar is after a hard workout, and Saturday I think he tried to kill me at the gym. So, after I thought I was going to pass out or worse, he decided I needed sugar and suggested we go get ice cream. But the way my tummy and head were feeling, I figured ice cream was the last thing I should ingest, so I declined. Even he was shocked and asked me something along the lines of “Who are you?” or “What’s wrong with you?” because I turned it down. I loves me some ice cream, but sugar and a queasy tummy – I do not like to mix. These taquitos, however, with their tortilla goodness would have been perfect to help settle my tummy, if I’d had any stashed in my gym bag. Which would actually be kind of gross now that I think about it. Food (other than something wrapped/sealed like a granola or protein bar) + gym bag = NO. Just no. A mere 30 minutes and these tasty taquitos can be on your dinner table, and more importantly, in your mouth! 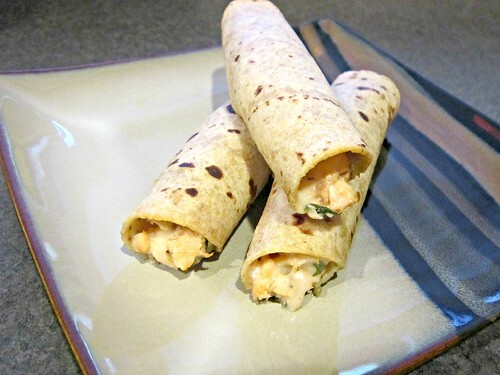 The garlic pesto, cilantro,and cheese are all great compliments to the salmon and as I said earlier – you can’t go wrong rolling it all together in a tortilla!! With guac! It is Taco Tuesday, y’all. No excuses. Just do it. Preheat your oven to 350 degrees F, line a baking sheet with foil and spray with cooking spray. Place the salmon fillets on the prepared baking sheet, skin side down if it has the skin, and spread 1 tablespoon of the garlic pesto on top of each fillet. Bake for about 15 minutes or until salmon is cooked through. Remove from oven and set aside to cool for about 10 minutes. Raise the oven temperature to 400 degrees F and line the baking sheet with a fresh sheet of foil. If the salmon has the skin on, use a spatula to separate the salmon from the skin and place it in a large bowl. Use the spatula to break the salmon into pieces, then add the salsa verde, cheese, and cilantro. Stir to mix well. Place 2 tablespoons of the salmon mixture in the center of each tortilla, one at a time, roll the tortilla up and place it on the prepared baking sheet seam side down. Repeat until all of the salmon mixture is used up. I got 10 taquitos out of mine, but I stuffed them fat. Spray the tops with cooking spray and bake for 10-12 minutes until golden brown. Meanwhile, prepare your guacamole by scooping the flesh of the avocado into a medium bowl and mashing with a fork until almost smooth. Add the Greek yogurt, lime juice, and garlic powder and stir and mash until very smooth. Season with salt and pepper, to taste, and then add a dash of hot pepper sauce if you want a little heat to it. Serve the taquitos with guac on the side to dip them in!